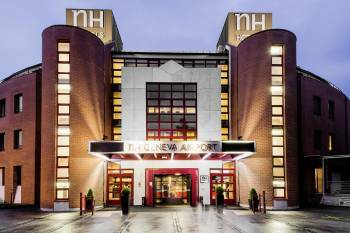 The 4-star hotel NH Geneva Airport offers 190 cosy rooms and 4 multifunctional conference and seminar rooms which are equipped with everything you will need. The distinctive characteristics of NH Hotel Group are stylish ambience, comfortable rooms, delicious food and the most modern technology, for a truly great stay.The hotel is located 2 minutes from the Geneva International Airport and the Congress centre Palexpo and offers a free shuttle service to these venues and the business area around the hotel. With the stop at only 400m from the hotel, tramways n° 14 and 16 will take you directly to the center of Geneva in only 18 minutes.We look forward to welcoming you! The various business services of our hotel are at your demand whenever you require them for a seminar, meeting or large event. Our 4 multifunctional conference and seminar rooms allow for meetings with up to 60 peopleand are equipped with the latest conference technology. Our business service team will happily assist you in every detail of planning and organization.